Gal in the Middle: RFOA: How Did I Get Here? 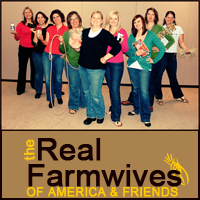 Several months ago, my bloggy and IRL friend Heather over at 3 Kids and Lots of Pigs started a little phenomenon over on Facebook called the Real Farmwives of America and Friends (RFOA). There are some great blogs that feed into this Facebook site and it's a great place to go and find lots of great posts in one place. When RFOA started, I was asked to join the group. 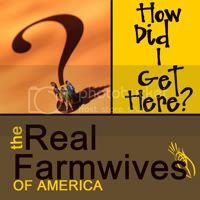 Since I don't live on the farm anymore and I'm not a wife, I didn't feel comfortable joining. However, since the majority of the ladies on the "Real Housewives" series are not wives or housewives, I have changed my mind! So, here we go...I'm playing catch up and posting my introductory piece "How Did I Get Here?" I grew up on a farm in central Indiana. My dad grew corn and soybeans and raised hogs with his dad (my grandpa) and my mom's brother (my uncle). Today, my dad and uncle still farm together and my brother-in-law is joining them this year. This is one of my favorite childhood photos. I'm on the right in red. 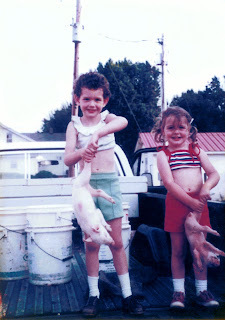 My older sister and I were "helping" our dad move hogs. When the baby pigs got big enough to be weaned from their mama, Dad and Uncle Sam would sort the pigs by size so the pigs in each pen were all around the same size. The "runts" (little guys) of the litter were separated and taken to a different barn. We were holding a couple of the runts. Now, I won't claim that the above photo is a reflection of my involvement on the farm as a youth. To my dad's dismay, none of his daughters were all that interested in helping out in the barn. However, as an active 4-H member, I had the opportunity to participate in 4-H Roundup as a 7th grader. I headed to Purdue University for a couple of days and found my calling...Agricultural Communications! For two days, I got to build my own newspaper page and record my own television interview and LOVED it. So, when I got home, I told my parents that I knew where I was going to college - PURDUE - and what I was going to major in - Agricultural Communications. I have always felt that this was the perfect combination of my background...my dad, the farmer, and my mom, the high school English teacher! When folks ask me what Agricultural Communications IS, I tell them I'm trained to talk to corn...they are all EARS! But, really I've been lucky to stay involved with agriculture while not staying on the farm. I've done everything from working at Iowa State University for their College of Agriculture to reporting about agriculture as an editor for a regional farm newspaper to working with farmers (corn, soybean, cranberry and more) to help them talk to others about the crops they raise, how they raise them and how they are used. So, that's how I got here! I'm excited to be a part of this group of funny, intelligent, wise, cool, funny (repeated this one for a reason) and I hope you go and check them out. That is awesome that you have combined a little bit of both parents into your career choice. If I had to redo it, I probably would have been an Ag. comm major too. Hahaha LOVE the pic!!! And yes i made it bigger to have an even closer look! Love the pics! Can't wait till FRIDAY!!!! Another English teacher mom! Cool! You are a very important part of our group, and I am so glad you have "officially" joined us because you have been one of RFOA since its beginning. So good to see you today. It's no nice to sit around a table with women who understand and encourage each other. I've been seeing the RFOA around. How can I get to be one of the gang? I was a farm kid and am now a farm wife. 4-H Round-Up!! That's what I'm talkin' about!!! !